As I start to ramp up my training again in preparation for the 2019 season, I’ve been thinking a lot recently about mindset. You can do all the training in the world but if your mindset isn’t right, it will always be a limiting factor. And before you switch off, this isn’t another inspirational, motivational post that tells you to be the best you can be! It goes deeper than that. For context, in the early years of starting out in triathlon, I managed to secure a few kit and equipment sponsors. Not once was I under the illusion that I was some great triathlete – in fact I explicitly said to my first bike sponsor: “You do realise I’m never going to win a race, don’t you?” The response was “Oh we don’t care about that, we just want to encourage more women to get into cycling and you’d be a good platform for promoting that.”. As it turns out, years later, I have won some small local races. But this blog isn’t about sponsorship, it’s about how you regard yourself. For me, I was always telling anyone close to me or those I trained with that I wasn’t any good at triathlon – I guess because I did manage to work with some brands I felt there must be some external social expectation that I was some amazing athlete, when in reality, I was far from it. So to keep myself ‘real’ and authentic, I told people quite patently that I was"pretty rubbish". (By the way, this does nothing for a positive mental attitude so I wouldn’t recommend it!) Years later, when I became a bit better than average/middle-of-pack age group (but still nowhere near top class! ), I stopped all the negative self-talk. But the point is, even in spite of the fact that I had this negative internal diatribe going, I regularly presented an image of myself as a better athlete than I actually was. I saw how the professional athletes promoted their sponsors on social media and did a similar thing. I was a rookie, but I was posting like I was some kind of pro. Haha. The only thing I was close to being pro at! This was, of course, in the earlier days of my triathlon endeavours, and I have changed the way I think about my performance and my potential. It’s not all about sponsors and becoming a social media annoyance. It’s about projecting an image of yourself that you’d like to adopt (even if you don’t already) – whether it’s internally to yourself or externally to the world around you. 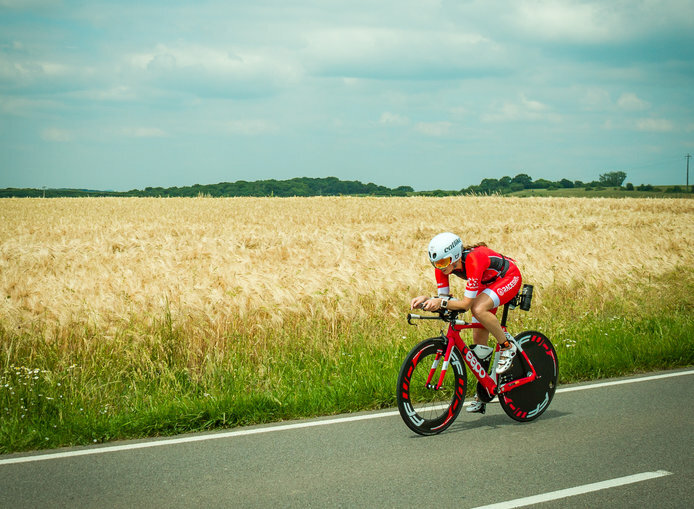 I never imagined I’d be any good at triathlon, but what I did know was that if I do everything I possibly can with a professional approach, I’ll have a much better chance of improvement than if I just go into it half-hearted. So I did just that. I got a coach, a nutritionist, a chiropractor, a masseuse, and a dedicated strength and conditioning coach. I worked with them all so we could optimise everything possible for the best possible result. Sure, I needed a lot more work and a hell of a lot more natural talent, but if you can cover all the small peripheral stuff as well, you would take any opportunity you can to improve, wouldn’t you? I always approached my triathlon pursuits like a professional, even though I never was one and never will be one. I put myself in the shoes of the best so I could at least get the best out of myself. A couple of years ago, I even got a mindset coach. I worked with Coach Raisie on this negative self-talk (which, although to a lesser extent, was very much still present). One of the key things I took away from this work was something Raisie said again and again to me: “Envision a future version of yourself, and embody that person. Become that version of yourself.” I guess, because if you don’t believe you can become great, you never will be. And that’s half the battle. She would make me imagine myself winning a race, embodying that feeling, experiencing it in my subconscious. Even if I never win a race in my entire life, it doesn’t matter, because just imagining it will put you in a much stronger place than a defeatist “I’ll probably come last anyway” attitude. I heard a quote once on a podcast which has stuck with me for a very long time: “It’s easier to act yourself into a new way of thinking than to think yourself into a new way of acting.” This is a really powerful lesson. To break that down, it’s much easier to start acting a certain way to shape your thinking, than it is to shape your thinking to drive a behaviour change. The mental application that would be required to change behaviour is one thing, but if you act it first, you can almost ‘trick’ your brain into a new way of thinking. This strongly parallels the things Raisie would say to me. You can trick your brain, it will always set limiters in place – it’s a built-in self-defense mechanism that harks back to our ancestors' rudimentary existence in the game of survival. But grey matter is malleable, and the force of acting is an easier mold to make than just spending a long time convincing yourself through thought processes. You can create new neural pathways and thought processes simply by acting it out. So, what I’m trying to say is that you can become the athlete you want to be. Don’t wait for it to happen to you. Simply embody it. Mindset is a game changer. So why place limits on yourself?